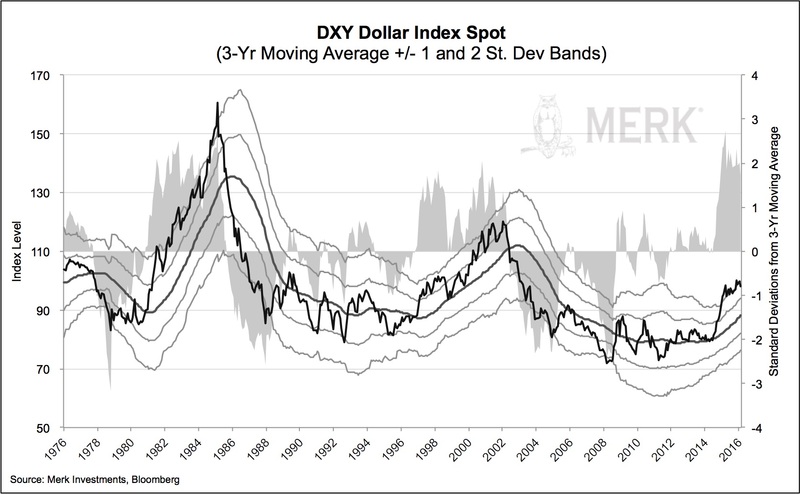 Merk Insights - Dollar Outlook: Peak Dollar? Is the dollar's seemingly relentless rise in recent years coming to an end? What are the implications not only for the greenback, but other currencies and markets around the world? It's widely anticipated that the Fed will continue to raise interest rates. So why would the dollar not rise? It turns out that we have been told for years now that the Fed will 'exit' from its extraordinarily accommodative policy. In our analysis, the U.S. dollar historically appreciates in anticipation of a hiking cycle, but not necessarily as rates actually move higher. What about rate differentials? The European Central Bank (ECB) just lowered rates again. While all else equal, a high interest rate differential may benefit the higher yielding currency, all else is rarely equal. Betting on such rate differentials is also referred to as a 'carry trade' strategy. In our analysis, carry trade strategies tend to perform well in 'risk on' environments, i.e. in environments when equities and other 'risk assets' do well. Let's pause to reflect that the U.S. dollar historically is considered a 'safe haven' when there is a 'flight to quality.' Remember 2008, when the dollar was widely considered the 'only safe place in town'? Well, the yen substantially outperformed the greenback that year, but, yes, the dollar - and notably U.S. Treasuries - were two of the few places where investors found refuge. But we have observed that for some time now, the U.S. dollar has tended to follow dynamics more typically associated with a high yielding currency, that is to rally in conjunction with the equity markets. This is no accident, as, on a relative basis, the U.S. dollar, has indeed become a high yielding currency versus many of its peers. The flip side of that is that we have observed the dollar often declines when equity markets plunge. This suggests that investors might want to gain some non-dollar exposure as a way to diversify their portfolio. Except they might want to hold non-dollar cash rather than equities, as international equities may also suffer when U.S. equities are under pressure. Rates bottoming in rest of the world? Negative interest rates have been difficult to work with for some banks. Notably, Draghi pointed out that banks lose money on some loans linked to overnight lending rates that are negative. By signaling that rates may not go down any further, banks may not restrict lending based on a fear that they may face more losses as rates go deeper into negative territory. Draghi appears to have shifted towards a new regime in trying to jumpstart growth in the Eurozone, focusing on boosting bank profitability with another newly announced program (TLTRO II) that, in our analysis, could cut bank funding cost in half for all Eurozone banks. As such, he appears to acknowledge that weakening the euro has not been the panacea to fix the ills of the Eurozone. Data in the Eurozone haven't been so bad. Indeed, listening to Draghi over the past 9 months, a lot of what he looks at looks pretty decent. In fact, just about all negatives he cited at his most recent press conference were risks outside of the Eurozone (global growth) or at least partially outside the control of the ECB (low energy prices). The conclusion we draw from this is that the bottom of the interest rate cycle may well be in for the Eurozone. Take Draghi's word for it, not ours. And we think his position creates a whole different dynamic for the U.S. dollar. On a somewhat related note, we have been arguing for some time that interest rates in Sweden, for example, are way too low. The economy there has good growth and low unemployment; it's just that inflation is rather low. In our view, the Swedish central bank (Risksbank) has been paranoid about ever more negative rates in the Eurozone; with that risk off the table, the Riksbank may soon be courageous enough to reverse course. Swiss National Bank President Jordan has also come out saying that there's a limit as to how far rates can go down. If you see a trend above, these are all European currencies. 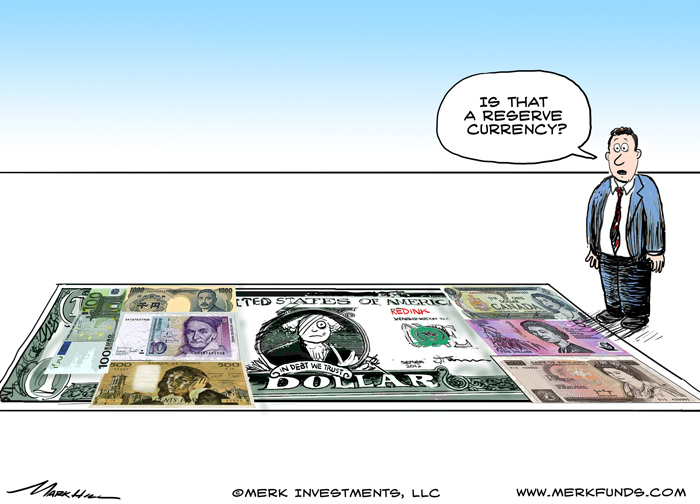 In contrast, so-called commodity currencies (e.g. the Australian dollar and Canadian dollar) have not been at zero or in negative territory. The dynamics there have also not followed traditional patterns. Still, Mr. Poloz, the head of the Bank of Canada (BoC), last week stated that the BoC wants to see how fiscal policy plays out before deciding on whether to cut rates further. Canada is one of the few countries that appears to be getting a serious fiscal stimulus (Prime Minister Trudeau was quick to discard his election promise to only have minor deficits). Australia is a bit of a special base, as central bank governor's Glenn Stevens term is expiring later this year; if we understand Mr. Stevens correctly, he wants out as the governor that did not need to resort to extraordinary policies. Indeed, the Australian economy has rapidly been adjusting, with the weaker Australian dollar helping. New Zealand, also considered a commodity country, in contrast, just lowered rates again, a reflection that the economy might have a more difficult time adjusting than Australia's. All that said, before we get too far ahead of ourselves, let's have a look at emerging market currencies. After declining rather substantially, they may be due for a rebound. But let's not forget that these tend to be tightly managed currencies. The dynamics there, in our analysis, are much more driven by liquidity than many other factors. And may make these currencies move more in tandem with U.S. equities. At the risk of oversimplification, the dollar's fate over the coming months may well be decided by how the stock market is doing. In many ways, the Fed's actions may also be tied to how the stock market is doing (but that's an analysis for another day). If our analysis is correct, a rising equity market may bode well for the U.S. dollar; a falling equity market may bode poorly for the greenback. We may be a tad biased, having provided an analysis last August that we think a bear market is upon us. In the context here, we might want to add that sovereign wealth funds may need to sell U.S. dollar denominated investments to cover budget shortfalls back home, providing pressure on both equities and the greenback. To expand on the discussion, please register for our upcoming Webinar entitled 'Black Swans?' on Thursday, March 23, to continue the discussion. Also make sure you subscribe to our free Merk Insights, if you haven't already done so, and follow me at twitter.com/AxelMerk. If you believe this analysis might be of value to your friends, please share it with them.